HeartShare’s Clinton Residence staff received the agency’s Spirit Award this month. 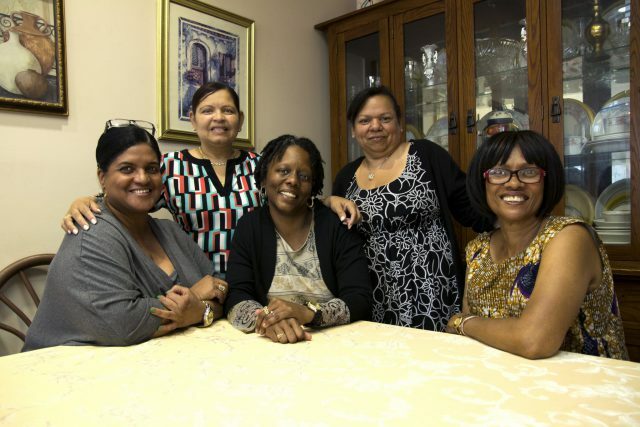 Direct Support Professional Grisel Pagan (second from right) went the extra mile to reconnect Marcel with his long-lost family members. HeartShare presented the Clinton Residence with its 2017 Spirit Award for providing outstanding services to our individuals with intellectual and developmental disabilities (I/DD) on Thursday, January 26, 2017. For the past 30 years, Marcel, a sweet and affectionate man with I/DD, has led a full life at Clinton. About a year ago, Direct Support Professional Grisel Pagan started to wonder about Marcel’s family. “The other residents have family members visit. Marcel deserves to have his family around him too,” said Grisel. Upon learning Marcel’s hometown, Grisel began her investigation in search of his family members. She learned about his time in foster care and the heartbreaking years he spent as a resident of the Willowbrook State School, which was exposed for inhumane conditions, forcing its closure in 1972. The more Grisel learned, the more she knew how much Marcel deserved to have his family around him. After hundreds of phone calls, Internet research and dead leads, Grisel finally reconnected Marcel with his four siblings and they’re planning a family reunion. The Spirit Award, given twice annually to HeartShare Developmental Disabilities programs, is a part of HeartShare’s culture of acknowledging outstanding employees and encouraging their professional growth.